- Check out the building to the northeast of Kakariko Village, the one with the big hole in the roof. The owner, Rosso, will give you the Power Gloves if you talk to him a second time after the short cut scene. With the Power Gloves you can pick up small rocks. Thanks, Rosso. - Pound the wooden pole blocking the cave behind his Shack with the Hammer. Inside is a chest containing 20 rupees. - Just south of the Shack is a Maiamai clinging to the cliff edge. Merge, get behind, and push it off. - Walk south one screen. Along the mountain's edge is a cave, blocked by stones. Heave the stones out of the way with your fancy new gloves. - Inside is a twisting path. Traverse it, minding the wriggly worms that bounce off the walls and generally annoy. Rods are an easy way to target them. - Across a bridge and back north you'll see a cave. It contains a mighty five rupees. Ooooo, swank. 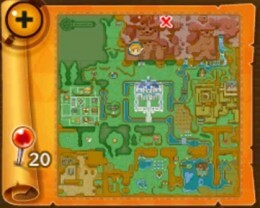 Merge with the wall beside the cave, though, and you can find a Bomb spot on a nearby platform that leads to 50 rupees. Much more reasonable. - Cross the bridge to the right. It leads to a narrow precipice with a single rock. Check under the rock for a Maiamai. - Up the next set of stairs is a weather vane to activate. Before entering the cave next to it, merge with the wall to the right and wander east to a second cave. Inside is a chest containing several Fairies and Monster Guts. - Inside the primary cave on this path is a long, twisting area filled with rolling rocks. You can destroy these with the Hammer, but it's easier to just stick to the stairs and avoid 'em altogether. Merge with the wall to cross gaps as needed. Near the end you'll find posts to pound down, one set of which is blocking Monster Guts. - There are two exits ahead. If you take the left exit, you'll find a chest containing 20 rupees. You'll also find a Maiamai clinging to the wall; merge with the wall to push it out and capture it. You'll land near the right exit. - Run west. Heed the sign and Don't Fall! You'll be shunted back a ways. - Inside are more rolling rocks, these ones heading generally down. Avoid them and make your way up and to the right. - Same deal in the next area. This time, make your way up and to the left. - Once you're outside, merge with the wall and walk east. Drop down to the cave below and run through. You'll find a Heart Piece on the other side. Run into the next cave up and you'll find a path to the top of Spectacle Rock, populated by Fairies. To the east is the Tower of Hera. If you want you can enter it right now, assuming you brought the Hammer... or you can go east, to find Rosso's Ore Mine. I wouldn't recommend it at the moment, though - you'll find some horribly strong enemies, and for now all you can discover down there are two Maiamais and some hard-earned rupees. On to the Tower it is, then! Inside the tunnel leading from Lost Woods to Death Mountain is a huge rock you can't move on your first trip through. Return later, though, and you can hurl it aside. Beyond is a ledge with a Maiamai.